A few things going on around here this week and last week in the world of SUFFERING SUCCOTASH. 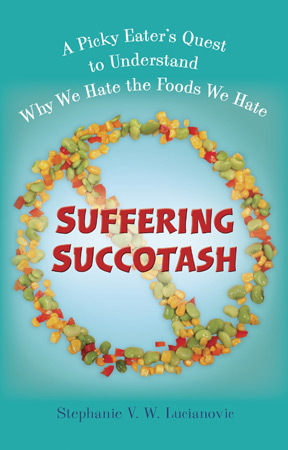 I have my first SUFFERING SUCCOTASH readings in San Francisco. Tonight, I'll be at Omnivore Books at 6:00 PM, and tomorrow I'll be at Book Passage in the Ferry Building at 6:00 PM. Come bring your picky unto me! 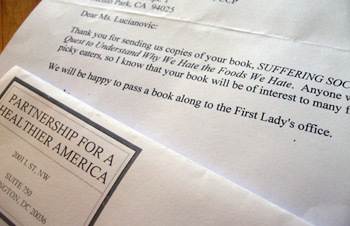 Also, I sent copies of the book to First Lady Michelle Obama's Partnership for a Healthier America and you can see the exciting letter I got in the mail from them. Here's my "lay off the parents of picky eaters!" piece at the New York Times Motherlode parenting blog. This morning Mitch Teich talked to me about picky eating on the WUWM radio show "The Lake Effect." Later this week, I'll be doing a live chat at the Washington Post. That will be happening on Wednesday from noon-1PM Eastern. Get online and type with me about picky eating! Check out more upcoming events and cool things about SUFFERING SUCCOTASH in events and press.